The information on this page is produced exclusively for healthcare professionals, and is not intended for consumers or patients. This publication is not intended as a substitute for medical therapy or as a manual for self-treatment. All readers should seek professional advice for any specific medical problem. The human body can manufacture most of the fats it needs, including cholesterol, saturated fatty acids, and unsaturated fatty acids. However, there are two families of fatty acids, the omega-6 and the omega-3 fatty acids, that are considered essential fatty acids. These fatty acids are essential because the parent omega-6 fatty acid, linoleic acid (LA), and the parent omega-3 fatty acid, alpha-linolenic acid (ALA), absolutely cannot be synthesized by the body and must be obtained from the diet or supplementation. Omega-3 fatty acids are essential fatty acids that are necessary from conception through pregnancy, and continue to support normal growth and development of infants. Throughout life, omega-3 fats aid in the prevention and treatment of heart disease, diabetes, arthritis, inflammatory diseases, and cancer.1 Omega-3 fatty acids also play an important role in protecting the health of the brain, eyes, and nervous system. Omega-6 fatty acids are abundant in nature, and responsible for the inflammatory immune response. Over 8,000 published clinical trials have unequivocally established that omega-3 fatty acids are important in human nutrition. This clinical guide is intended to provide the healthcare practitioner with a basic understanding of omega-3 fatty acids and how to best utilize their powerful health-promoting qualities in the clinical setting. The primary source of omega-6 fatty acids in the human diet is linoleic acid (LA) from the oils of seeds and grains. Sunflower, safflower, soy, and corn oils are particularly rich in linoleic acid. Evening primrose oil, borage oil, and black currant oil are unique due to their relatively high content of the health-promoting omega-6 fatty acid, gamma-linolenic acid (GLA). The primary dietary source of omega-3 fatty acids is alpha-linolenic acid (ALA) from seeds and seed oils that are derived from plants such as flax, walnuts, and canola. Fish and fish oils are the richest source of preformed long chain omega-3 fatty acids, Eicosapentaenoic Acid (EPA) and Docosahexaenoic Acid (DHA). Humans have evolved consuming a diet that contained approximately equal amounts of omega-3 and omega-6 fatty acids. About 100 years ago, the industrial revolution introduced technology that allowed for the refining of vegetable and seed oils, which led to a dramatic increase in the consumption of omega-6 fatty acids among the industrialized countries. In addition, the introduction of animal feeds derived from grains rich in omega-6 fats has resulted in the production of meat, fish, and eggs high in omega-6 fats and virtually void of omega-3 fats. Today, in Western diets, the ratio of omega-6 to omega-3 fatty acids ranges from 20:1–30:1 instead of the pre-industrial range of 1:1–2:1.5 A large body of scientific evidence has established that a high intake of omega-6 fatty acids shifts the physiological state to one that promotes thrombosis, vasoconstriction, inflammation, and poor cellular health. The physiologic changes that result from high intake of omega-6 fats has been implicated in pathophysiology of heart disease, diabetes, autoimmune and inflammatory diseases (rheumatoid arthritis, colitis ulcerosa, multiple sclerosis, lupus, asthma, etc. ), depression, dementia, and other chronic diseases. A large body of scientific evidence suggests that aberrant inflammation underlies many common chronic diseases and is an obstacle to overall good health. The direct role of arachidonic acid-derived lipid mediators in promoting inflammation and EPA- and DHA-derived lipid mediators in regulating the resolution of inflammation has initiated much scientific interest in the influence of the omega-6:omega-3 ratio on human health. The most rigorous evidence supports using fish oil to benefit the hearts of healthy people, and those at high risk of, or who have, heart disease. Evidence from a multitude of large, well-conducted, controlled clinical trials demonstrate that omega-3 fats support cardiac health. The evidence is so strong that the American Heart Association (AHA) considers increasing omega-3 fatty acids as a vital public health intervention, and encourages physicians to recommend their consumption. In fact, the AHA guidelines include recommendation for all Americans to consume omega-3–rich fish at least twice weekly. 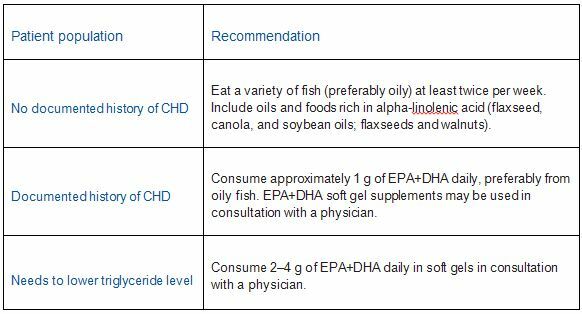 For individuals with documented heart disease, the AHA recommends 1 gram of EPA+DHA daily, and for patients with elevated triglycerides 2–4 grams of EPA+DHA daily. Research has shown that omega-3 fats are necessary to develop, maintain, and protect structures of the central nervous system from conception through pregnancy and infancy and, undoubtedly, throughout life. There is some debate with regard to the relative importance of EPA versus DHA, but there is an overall scientific consensus that both EPA and DHA contribute to cognitive health and development as well as mental well-being, behavior, learning, and mood. Most evidence suggests that DHA is particularly important for development of the brain and nervous system in infants, protection and repair of brain and nervous tissue from age-associated damage, and improving mental function. Inflammation is a normal protective physiological mechanism, but several factors in the Western diet, including excess omega-6 fat intake, and a relative deficiency of omega-3 fats, result in long-term inflammation. Omega-3 fatty acids from fish oil have anti-inflammatory effects due to the competition of EPA with AA in the cyclooxygenase and lipoxygenase pathways. In addition, omega-3s contribute to the formation of resolvins and protectins, which aid in the removal of inflammatory cells, and restoration of tissue homeostasis once the need for inflammation is over. Pharmacological anti-inflammatory drugs are effective in reducing inflammation, but carry potentially dangerous side effects, rendering them impractical for long-term use. Several well-designed clinical trials have examined the use of fish oil on nonsteroidal anti-inflammatory drug (NSAIDS) use or steroid use in non-surgical back pain and rheumatoid arthritis. These trials show that fish oil consistently demonstrated a reduced requirement for anti-inflammatory drugs and improved clinical outcomes. (32) The anti-inflammatory benefits of fish oil are generally attained at a minimum dose of 3 grams of EPA+DHA and require 8–12 weeks of supplementation to realize these benefits. Research has also shown that getting enough DHA during pregnancy improves the health of offspring in several ways. Omega-3 fatty acids from fish oil help maintain healthy structure and function of ocular tissue. DHA is particularly important for the eyes, and attains its highest concentration anywhere in the body within the eye tissue. (47) Certain unique biochemical characteristics of DHA make it vital for the development, function, and maintenance of the highly active, light-receiving cells found in the eye. Research has shown that DHA is necessary to develop, maintain, and protect visual structures from conception through pregnancy, infancy, and throughout life. Dosing is based on the amount of EPA+DHA in a product, and not on the total amount of fish oil. Supplements vary in potency and the percentage of EPA and DHA in the oil. Experts recommend 500–1000 mg EPA+DHA per day to maintain health and avoid deficiency. Therapeutic doses of EPA+DHA range from 1 to 4 grams. To support the body’s anti-inflammatory response, clinical studies suggest a minimum of 3 grams of EPA and DHA with some studies using 10 grams or more. The most well documented benefits of omega-3 fatty acids are for heart health, although omega-3s have shown proven benefits for a number of health conditions stemming from these fats’ anti-inflammatory properties. The American Heart Association’s recommendations on dosage follow. The US Food and Drug Administration (FDA) classified omega-3 fatty acids from fish oil as “generally recognized as safe” (GRAS).52 In fact, The FDA has ruled that up to 3 g of EPA+DHA is safe to be included in the food supply of Americans without fear of adverse events.53In addition, there are no known significant drug interactions with omega-3 fatty acids.54 When using higher amounts of EPA and DHA in the clinical setting, it is important to monitor the use, efficacy, safety, and potential interactions. The hemodynamic effects of omega-3 fatty acids have led to theoretical concerns about increased risk for bleeding at higher doses (above 3 grams EPA+DHA), if taken with blood thinning medications, or before surgery. The theoretical risk of clinically significant bleeding has not been verified in a controlled setting. A 2007 expert opinion published in the American Journal of Cardiology concluded that omega-3 fatty acid supplements do not increase the risk for clinically significant bleeding, even in patients also being treated with antiplatelet or anti-thrombotic medication.55 The therapeutic use of omega-3 fatty acids perioperatively to improve surgical outcomes and reduce adverse events is also the subject of current clinical investigations. 1. Simopoulos AP. The importance of the omega-6/omega-3 fatty acid ratio in cardiovascular disease and other chronic diseases. Exp Biol Med 2008;233:674–688. 2. Emken EA, Adlof RO, Gulley RM. Dietary linoleic acid influences desaturation and acylation of deuterium-labeled linoleic and linolenic acids in young adult males. Biochim Biophys Acta 1994;1213:277–288. 3. Pawlosky RJ, Hibbeln JR, Novotny JA, et al. Physiological compartmental analysis of alpha-linolenic acid metabolism in adult humans. J Lipid Res 2001;42:1257–1265. 4. Kris-Etherton PM, Harris WS, Appel LJ; American Heart Association. Nutrition Committee. Fish consumption, fish oil, omega-3 fatty acids, and cardiovascular disease. Circulation 2002;106:2747–2757. 5. Simopoulos AP. Essential fatty acids in health and chronic disease. Am J Clin Nutr 1999;70:560S–569S. 6. Crowe FL, et al. Serum phospholipid n-3 long-chain polyunsaturated fatty acids and physical and mental health in a population-based survey of New Zealand adolescents and adults. Am J Clin Nutr 2007;86:1278–1285. 7. McNamara RK. Long-Chain Omega-3 Fatty Acid Deficiency in Mood Disorders: Rationale for Treatment and Prevention. Curr Drug Discov Technol 2011 Aug 15. 8. Karlsson M, Mårild S, Brandberg J, et al. Serum Phospholipid Fatty Acids, Adipose Tissue, and Metabolic Markers in Obese Adolescents. The North American Association for the Study of Obesity 2006:14;1931–1939. 9. Noreen EE, Sass MJ, Crowe ML, et al. Effects of supplemental fish oil on resting metabolic rate, body composition, and salivary cortisol in healthy adults. J Int Soc Sports Nutr 2010 Oct 8;7:31. 10. Li Y, Seifert MF, Lim SY et al. Bone mineral content is positively correlated to n-3 fatty acids in the femur of growing rats. Br J Nutr 2010 27:1–12. 11. Yurko-Mauro K, McCarthy D, Rom D, et al. Beneficial effects of docosahexaenoic acid on cognition in age-related cognitive decline. Alzheimers Dement 2010 Apr 29. 12. de Batlle J, Sauleda J, Balcells E, et al. Association between Ω3 and Ω6 fatty acid intakes and serum inflammatory markers in COPD. J Nutr Biochem 2011 Sep 1. 13. Pilkington SM, Watson RE, Nicolaou A, et al. polyunsaturated fatty acids: photoprotective macronutrients. Omega-3 Exp Dermatol 2011 Jul;20(7):537–43. 14. Bazan NG, Calandria JM, Serhan CN. Rescue and repair during photoreceptor cell renewal mediated by docosahexaenoic acid-derived neuroprotectin D1. J Lipid Res 2010 Aug;51(8):2018–31. 15. Huss M, Volp A, Stauss-Grabo M. Supplementation of polyunsaturated fatty acids, magnesium and zinc in children seeking medical advice for attention-deficit/hyperactivity problems – an observational cohort study. Lipids Health Dis 2010 Sep 24;9(1):10. 16. Mozaffarian D, Stein PK, Prineas RJ, et al. Dietary fish and omega-3 fatty acid consumption and heart rate variability in US adults. Circulation 2008;117:1130–1137. 17. Hauenschild A, Bretzel RG, Schnell-Kretschmer H, et al. Successful treatment of severe hypertriglyceridemia with a formula diet rich in omega-3 fatty acids and medium-chain triglycerides. Ann Nutr Metab 2010;56(3):170–5. 18. Pedersen MH, Mølgaard C, Hellgren LI, et al. Effects of fish oil supplementation on markers of the metabolic syndrome. J Pediatr 2010 Sep;157(3):395–400,400.e1. 19. Simopoulos AP. The omega-6/omega-3 fatty acid ratio, genetic variation, and cardiovascular disease. Asia Pac J Clin Nutr 2008;17 Suppl 1:131–134. 20. Mozaffarian D. Fish and n-3 fatty acids for the prevention of fatal coronary heart disease and sudden cardiac death. Am J Clin Nutr 2008;87:1991S–1996S. 21. Abeywardena M, Patten G. Role of ω3 Longchain Polyunsaturated Fatty Acids in Reducing Cardio-Metabolic Risk Factors. Endocr Metab Immune Disord Drug Targets 2011 Sep 1;11(3):232–46. 22. Jacobson JL, Jacobson SW, Muckle G, et al. Beneficial effects of a polyunsaturated fatty acid on infant development: evidence from the inuit of arctic Quebec. J Pediatr 2008;152:356–364. 23. Helland IB, Smith L, Blomén B, et al. Effect of supplementing pregnant and lactating mothers with n-3 very-long-chain fatty acids on children’s IQ and body mass index at 7 years of age. Pediatrics 2008;122:472–479. 24. Bazan NG, Molina MF, Gordon WC. Docosahexaenoic Acid signalolipidomics in nutrition: significance in aging,neuroinflammation, macular degeneration, Alzheimer’s, and other neurodegenerative diseases. Annu Rev Nutr 2011 Aug 21;31:321–51. 25. Nurk E, et al. Cognitive performance among the elderly and dietary fish intake: the Hordaland Health Study. Am J Clin Nutr 2007;86:1470–1478. 26. Rondanelli M, Giacosa A, Opizzi A, et al. Long chain omega 3 polyunsaturated fatty acids supplementation in the treatment of elderly depression: effects on depressive symptoms, on phospholipids fatty acids profile and on health-related quality of life. J Nutr Health Aging 2011;15(1):37–44. 27. McNamara RK, Nandagopal JJ, Strakowski SM, et al. Preventative strategies for early-onset bipolar disorder: towards a clinical staging model. CNS Drugs 2010 Dec 1;24(12):983–96. 28. G. Paul Amminger, MD; Miriam R. Schäfer, MD, et al. Long-Chain -3 Fatty Acids for Indicated Prevention of Psychotic Disorders A Randomized, Placebo-Controlled Trial. Arch Gen Psychiatry 2010 Feb;67(2):146–54.